Nestled in a peaceful hill village, this intriguing cottage built into the rock is the perfect place for a romantic getaway or a base for families to explore the area. It's situated at the edge of a charming hill village halfway between the high Pyrenees and the sea, and enjoys a Mediterranean climate. Both the house and private garden have spectacular south-facing mountain views. The house is built into the rock and remains cool in summer and retains heat in winter. Bedroom 2: Twin beds. Bathroom is reached via this room Bathrooms: Bathroom with wc, sink and shower. The bathroom is on the 2nd floor, adjoining Bedroom 2. Also hairdrier, plug-in electric heaters, hot water bottles for winter nights if required, iron, washing line in the garden. Garden: swing, walnut trees, fantastic views of canigou, table and chairs. The stairs up to the first and second floors are steep, so very young children will need to be supervised, and the house is not suitable for people with mobility issues. There is a safety gate at the top of the stairs in bedroom 2, so children can go to bed there safely. It's a beautiful quiet village perched on the mountainside. At the top of the village there is a small playground for children, plus a basketball/football court with views of Canigou. The village of Olette is 5 mins drive away, and has a cafe/bar, pharmacy, butcher and bakery/ mini grocery store for basic provisions. Prades is 25km to the east and has large supermarkets, restaurants and a wide variety of other facilities, including an excellent Tuesday market. The countryside around the house and throughout region is wonderful for those with an interest in nature, hiking, mountain biking. High mountains, deep gorges, caves, crystal clear rivers and lakes are all around. The garden looks down into the river valley where the narrow gauge ‘Petit Train Jaune' (Little Yellow Train) takes passengers on one of Europe's most dramatically scenic train routes. Close by, mineral rich hot springs flow out from the mountains, into bathable pools, both within their natural setting and within the lovely open air swimming pool establishment at St Thomas les Bains (10km away). Skiing at both Font Romeu and Cambre D'Adze is 35 mins drive away. The region is rich in historical interest with many Romanesque churches and ancient abbeys. Several of the ‘Plus Beaux Villages de France' are within a short drive. A car is essential. Airport: Perpignan (1 hour), Girona (2 hours), Carcassonne (2 hours) Barcelona (2 hours 45 mins) Train: Olette (5km). The village is reached by 3km of mountain road with six hairpin bends and a few narrow stretches where two cars cannot pass each other. You may prefer to arrive during daylight hours if this concerns you. Car parking is available in the centre of the village, a two minute walk from the house. The location of the parking and the steepness of the internal stairs make the house unsuitable for those with mobility problems. We live in Greenwich, London. I work for the BBC and my husband is a historian with King's College London. We have two small children and love to spend time walking in the mountains, paddling in the rivers and swimming in the thermal pools. We fell in love with this house when we rented it for a summer holiday in 2014. It's in a tiny, picturesque village perched on the mountainside. We love the peaceful atmosphere and wonderful views. The house is on a path with friendly neighbours and no cars so it's very quiet and safe for children. We love how we are one of the last houses in the village so you can walk out of the front door and be on a hiking trail in seconds. The house is cozy in winter and cool in summer due to the house being built into the rock face. When the house came up for sale we decided it was too unique to pass up. We are happy to share the house with friends, family and guests and hope you love it as much as we do. 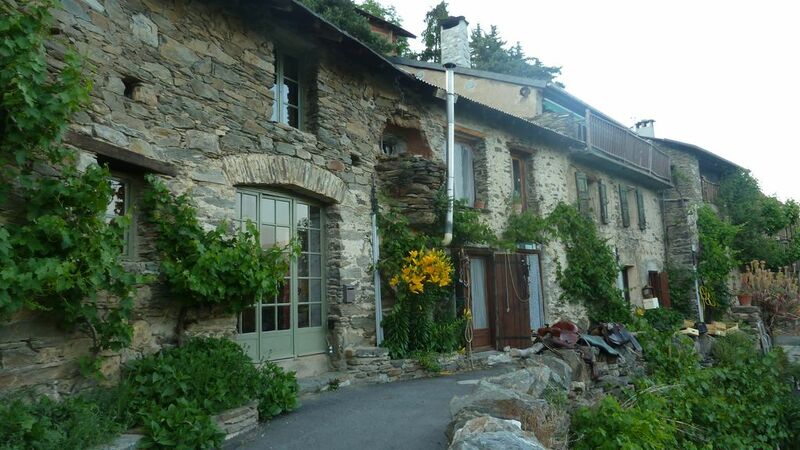 The house is in a great location for walking, skiing, hiking, picnicking and for relaxing at the end, we are a short drive from the wonderful open air thermal pools of St Thomas les Bains. The private garden has fabulous views of the mountains and le petit train jaune passing below. There's a swing in the walnut tree which the kids will love. We have young children ourselves and are happy to share their books and toys with guests. Our neighbours rear traditional Pyrenean goats and you will hear their bells as they come in from grazing on the mountainsides in the early evening. There are two electric heaters but we haven't needed them so far! The wood stove keeps the house warm in the evenings in autumn/winter. There is free parking in the village. You can't park at the property itself as it is on a footpath, not a road. It's a couple of minutes walk from the parking to the house. The house has wifi. We will provide the password with the welcome information. The living room has a wood-burning stove which provides a cozy feel in the colder months. We provide some firewood, kindling and lighter blocks. A sofa with two armchairs, two coffee tables and a rug, arranged around the wood stove. The living room is open plan with the kitchen and dining area. Medium-sized counter-top fan oven, that can also grill and has rotisserie. Well stocked with cutlery, crockery, small electric whisk, salad spinner, muffin trays, corkscrew, pots and pans. Glass baking bowl. And lots more! Round dining table with 4 matching chairs, extra chairs are available in the house. Some guidebooks, novels, maps and children's books are provided to share on the bookcase. They are predominantly in English. Garden with walnut trees and spectacular views of Canigou. Fenced in which helps with young children. Accessible from the main bedroom. Chairs, table and parasol provided. Skiing at Font Romeu and surrounding areas nearby. Friendly, accessible resorts with a range of classes and facilities. Views better than the images can show and the night sky seems to be so close you could reach out and touch the stars. Birds flying below you is a rather extraordinary experience! Although small, the location of the house is perfect for walking and exploring the eastern Pyrenees. Simple accommodation over three floors. Garden accessible from first floor bedroom too. Wonderfully friendly neighbours and villagers. We were invited to a choral concert of music both sacred and profane in the tiny church. One of the most moving and memorable evenings ever, with drinks and food in the Mairie afterwards. Utterly unique. Could only be improved with more comfortable seating inside and out and good pillows! A trolley for luggage would also be useful - it’s a steep walk up and down from the parking places with lots of bags! If you are staying for a weekend this wouldn’t be a problem. We were on a three week tour of southern France and northern Spain so not being able to drive up and drop off food and luggage made it a hard slog. We’re delighted you had such a memorable stay. Great idea about the trolley. A new sofa is on our list..! What an experience! High in the mountains in a gorgeous stone home, the views are breath-taking. The little village is picturesque and inviting, and the house is cozy, clean and comfortable. It's rustic, yet complete with everything we needed. We enjoyed warm fires and the kids loved playing out in the yard with the panoramic Pyrenees behind them. We still can't get over the spectacular surroundings. Very clean and with everything we needed, this was such a wonderful place from which to discover the area and the local sulphur hot springs. Nous avons passé, ma famille et moi, 4 jours magnifiques et inoubliables. La beauté du site, de la maison, l'accueil des habitants du village, tout a été parfait. The Sentier Vauban (seventeenth-century military route, now a beautiful walking path), passes outside the house, and continues through woods and across the hills to Llar and then Mont Louis. Beautiful walled city on the N116, ten minutes drive from Canaveilles (drive down to the main road and turn left). Spectacular walk with some shade. Good for hot days. Lots of families walk here so manageable though serious hikers can do the full walk. Hot springs feed into the River Tet, and stones have been arranged to create warm pools. You’ll see cars parked at the bottom of the road to Canaveilles. Walk down to the river on the path opposite the road up to Canaveilles – you have to wade across the river to get to the pools. Walled town, with a solar oven – leaflet in sideboard drawers. Looks spectacular, huge mirrored solar panel. Information centre in Eyne village with exhibitions, information, botanical garden and café by a little river, with parking. Opposite is a small riding centre. Ten minutes further drive from Eyne, on the road signposted to Sailagouse, is the village of Llo. There are great gorge walks, and Thermal Baths. The village has a wonderful called Le Jardin D’Allone about 10 mins drive away. There is a lovely walk in LLo with thermal baths – bring your own towels. Village spread across the hillside to the north-east of Prades (you’ll see it if you drive from Perpignan), with beautiful houses covered in flowers, cafés, artist studios, and views of Canigou. One of ‘les plus beaux villages de France’. A lovely place to spend an afternoon wandering about. A small, beautiful old spa village in Castellane valley to the north of Prades, with a number of hotels (the largest is the Le Grand Hotel), and a thermal spa with massage, gyms &ca (www.companiedesspas.fr). Beautiful medieval village on rocky spur in lush Castellane valley to the north of Prades. Cafes, Bistro, church. Drive to Molitg-les-Bains and then ten minutes further on. Check in 1600. Check out 1100. We can usually accomodate an early checkin or late check out for an additional fee, if arranged in advance.